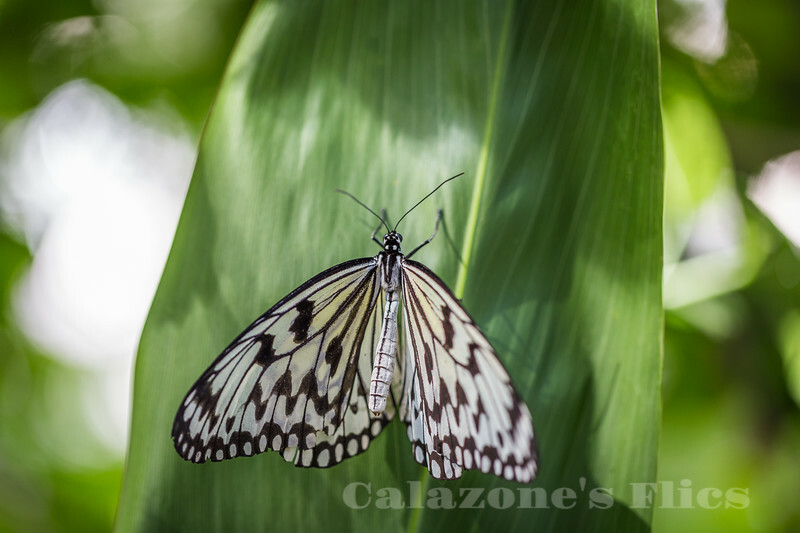 The Paper Kite, Rice Paper, or Large Tree Nymph butterfly (Idea leuconoe) is known especially for its presence in butterfly greenhouses and live butterfly expositions. The Paper Kite is of Southeast Asian origin. Paper Kite's are thought to be distasteful to birds. Their bodies contain toxins which are derived from the lactiferous larval foodplants, and are often supplemented by further toxins sequestered from adult food sources. The bright wing patterns "advertise" these unpalatable qualities, in much the same way that the bands of yellow and black of wasps advertise the fact that they can sting. Consequently any bird that suffers the highly unpleasant experience of tasting a Danaine is unlikely to attack other similarly coloured butterflies. Effectively, a few individuals are sacrificed for the good of the species as a whole. There are 12 Idea species, of which 5 occur in West Malaysia i.e. hypermnestra, leuconoe, lynceus, iasonia and stolli. The other 7 species are found variously in India, Sri Lanka, Myanmar, Thailand, the Philippines, Sumatra, Borneo, Sulawesi, Irian and Papua New Guinea. Tree Nymphs are very large butterflies, characterised by having translucent white wings patterned with black veins, and numerous oval black spots. They are noted for their slow and very graceful flight, which gives them the appearance of white handkerchiefs floating gently on the breeze. Idea leuconoe occurs in West Malaysia, and possibly on Taiwan and the Philippines, although there is some confusion among taxonomists about whether the non-Malaysian forms are subspecies of leuconoe, or of another species.